Islamic Clerics In Bangladesh Protest Nobel Laurent For Pro-Gay Support, Chant "Execute Him". Home/Featured/Islamic Clerics In Bangladesh Protest Nobel Laurent For Pro-Gay Support, Chant “Execute Him”. Islamic clerics across Bangladesh gathered to hold protests against Muhammad Yunus, a Nobel laureate and micro-loan pioneer, because of remarks he made in 2012 in support of gay rights. Maolana Moniruzzaman Rabbani, secretary of a committee that helps run the national mosque in Dhaka, said organizers would distribute 600 000 leaflets outlining Yunus’s statement against violence and opposing discrimination against gay people. The 73-year-old economist made the statement along with three other Nobel laureates in April 2012 following prosecutions of gay people in Uganda. “We’ll hold a massive rally against Yunus in the capital on October 31,” said Rabbani, who is also secretary general of the Islamic Oikyajote political party, which claims to be allied with the government. “We have asked all Muslims to be united against Yunus’s move to destroy our family and society,” he said. 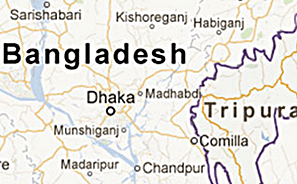 Homosexuality is outlawed in Bangladesh. A spokesperson for Yunus declined to comment because of the sensitivity of the issue. He is currently not in Bangladesh. The campaign is the latest aimed at discrediting and attacking Yunus in Bangladesh. Yunus was fired in 2011 from Grameen Bank, the micro-credit pioneer he founded, after he angered the current Prime Minister Sheikh Hasina by joining politics briefly. Bangledesh one of the poorest countries in the world and is one of the biggest recipients of Euro-diaspora charity.